“BOOOOSSS” made it sound like he was getting the ghosts confused with enemies from a different game, and “BOSSSS” makes it sound like he’s trying to speak Parseltongue. I can’t win. 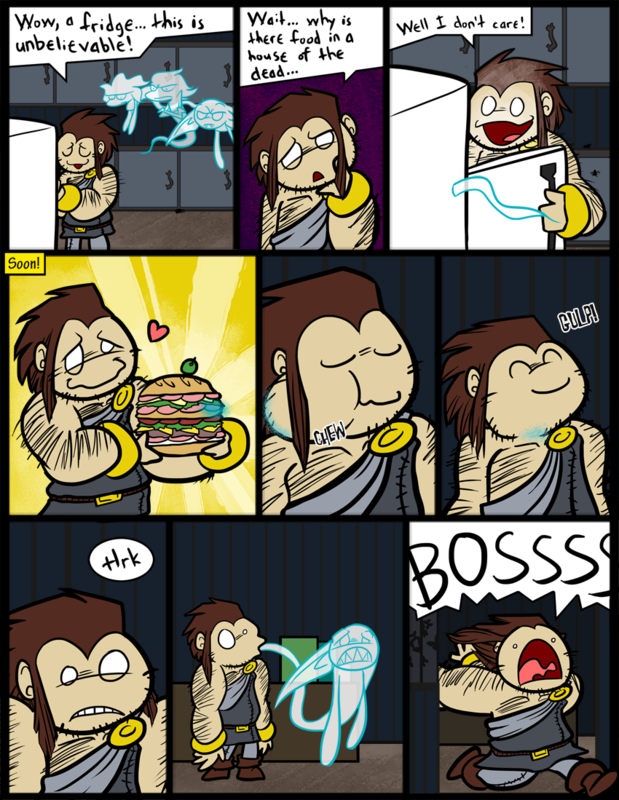 Speaking of Boos, this comic reminds me of Tubba Blubba. Also, Derk’s soul is communing with the viands. That reference will be appreciated by exactly one person, so he better be reading this. Nice lampshade-hanging there, Derk my man. Onto bookkeeping business: I should be able to pay my rent with no problem now… but as of just this week I am balancing three part-time jobs, school, band, and the comic. So I really do apologize for the updates being so uncertain lately, but I think you will understand. Things should balance out soon as I get used to it all. I am happy… just tired. haha love the poor ghost’s face in the second to last panel. he may have finally scared Derk, but i dont think he’s too happy about it. dont worry about it. i can totally understand about being overwhelmed with work, but the fact that you are still working on this and not abandoning it is enough for me. i dont care how erratic the posts are, as long as there are posts. Hahaha, I get it, I get it! I really cracked up at the look of horror on the ghost’s face! The ghost intended to pop out of that piece of ham, but didn’t anticipate just how quickly Derk could shove an entire sandwich down his gullet. …. Why IS there food there? It’s like Castlevania where there are whole cooked meals in the walls. Well, at LEAST it makes more sense than that! Possessing anything edible is usually a bad idea. The stomach is not a pleasant place, Mr. Ghost. Not pleasant at all. How do you know? At any rate, your avatar fits very well with that statement. Well, I’m assuming it isn’t. Being digested isn’t exactly how I’d want to spend my weekend. Yes, I find that my avatar fits my real life reactions to a lot of things. And since this is the internet and one little click can lead you to something that will take a couple sessions of therapy to get over, I just decided to make it my avatar on everything. Someone needs to turn that last panel into an image. I’m inclined to suggest the second-to-last frame, myself, either as a single image or an avatar from the face each of Derk and the ghost. As to “BOSSS!”, I think that the option that you chose works pretty well: the fact that it’s all in caps tells us that it’s shouted (or rather screamed, in this case), which I suspect prompts us to be prepared to deal with some degree of distortion. By the way, have we seen any dungeons other than the lava dungeon, the Temple of Terror and Frozio’s ice dungeon, and if so, who were their guides / dungeon masters? Oh, and if I may ask, what was the “communing with the viands” reference? Anyway, one of my AcDec friends is a regular reader, but another one actually popped up today too! Heh, that line about the sun does sound a little silly. Mire Manor and Posthumous fill those roles as well; we’re just breaking away from the formula. Am I the only one who is reminded strongly of Shaggy by the forth frame? You know, spooky mansion, unexplainable fridge filled with sandwich food, a rather large sandwich. It is all reminiscent of Scooby Doo for me. Also, on a side note, I saw something that reminded me of you Courtney. My cousin used the word “lold” in the written form on Facebook the other day and it reminded me of your acdec speech. Just thought you should know. Scooby Doo is our inspiration for this whole arc. There will be some even more blatant references later. but it failed to swallow a thing..
Oh, he swallowed something alright. He swallowed TOO MUCH. I finally caught up (been reading this since 2am and now it’s… 5:30!) and I’m enjoying this so much. I picture him with Shaggy’s voice and everything! Eeee!! Thanks, I’m glad you enjoyed it, you wonderful human being! At first I thought the ham was… a sleeping zombie that turned into a ghost due to being destroyed, had to read the comic over again but it was worth it. This is MUCH less disease-carrying! Take your time, we can wait. Well, some of us. : P At least you warn us! Don’t take your time! Do it now or be forever forgotten and discarded by those who once claimed to love you and/or your work!